The AFC North has never quite been the fantasy dynamo like other divisions are, but in 2017, the division as a whole plummeted to a new low. The Cincinnati Bengals offense had long been the younger stepbrother to the Pittsburgh Steelers from a fantasy standpoint, but they crashed and burned last season following the losses of left tackle Andrew Whitworth and left guard Kevin Zeitler in free agency. Andy Dalton has struggled under pressure his whole career and in 2017 his struggles rendered him waiver-wire fodder while holding back Joe Mixon and even A.J. Green to an extent. Making matters worse, rookie top-10 pick John Ross didn’t register a single catch. The Steelers and Ben Roethlisberger caught fire to end the season, giving this division some fantasy value, but it was another forgettable year for the Baltimore Ravens and Cleveland Browns from a fantasy standpoint. 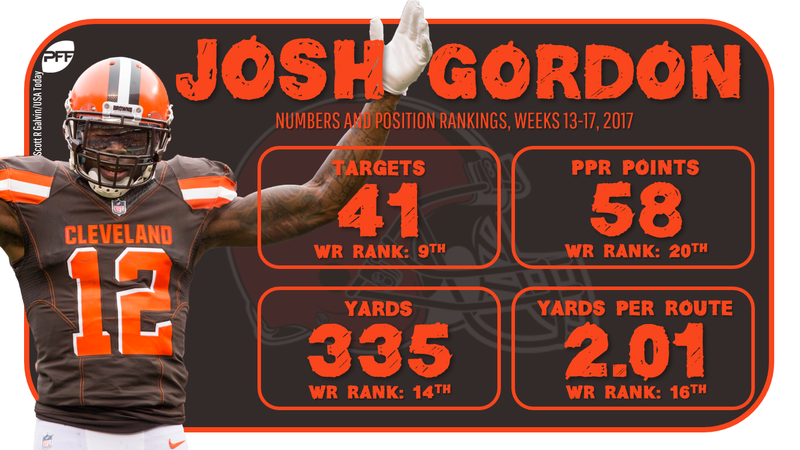 Even the return of wide receiver Josh Gordon in Cleveland couldn’t turn things around — he was force-fed targets but they were from DeShone Kizer. These teams have changed a great deal heading into 2018. The Bengals have improved their offensive line with the additions of Cordy Glenn and Billy Price. The Ravens had added new talent at wide receiver in Michael Crabtree and John Brown. The Browns have added a ton of talent in Tyrod Taylor, Jarvis Landry, Nick Chubb, and Carlos Hyde. It’s time to find out if the non-Steelers members of the AFC North can dig themselves out of the fantasy basement in 2018. Over the next four weeks, we will preview every division and pinpoint four to five players to track during training camp and the preseason. From now until the start of the season, the only real information we’ll need to gather is about a player’s role and chemistry within his offense. We started with the AFC East and NFC East — today we’ll jump into the AFC North. The goal is to provide you with players to add to your targets list now for season-long leagues, but also with players to target or avoid in best-ball drafts that are currently underway on DRAFT and MFL. Gordon finally returned to the NFL in 2017 and played in his first game since the 2014 season. He played in all five games following his return without topping five receptions in a single game, but that didn’t stop the Browns from trying. Gordon was targeted a whopping 41 times but he never developed a rapport with since-traded quarterback Kizer. In addition to immediately being featured in the passing game overall, Gordon was also targeted downfield early and often. These factors combine to make Gordon an interesting fantasy asset for 2018 given the addition of quarterback Taylor. Given Gordon’s soaring ADP, he’ll have to emerge as a WR1 to be a fantasy value. Taylor developed a rapport on deep passes (balls that traveled 20-plus yards in the air) with Sammy Watkins during their tenure in Buffalo and the hope is he can do the same with Gordon. Although the Browns are improved heading into 2018, they spent the majority of their major offseason assets on offense. As we learned in the Pro Football Focus Fantasy Playbook run/pass splits based on game script, the Browns passed the ball on a higher percentage (80 percent) than all but one team in 2017 when trailing by more than one score. Based on gamescript stats, the Browns’ offense took the highest percentage of snaps while trailing. With the same offensive scheme in place, volume should not be an issue for the Browns passing game. If Gordon continues to be featured, the addition of Taylor could be enough to get him in the weekly WR1 tier. What to watch for: Skip over any of the reports about Gordon’s physique or the one-handed practice catches he is making. None of this matters. What you want to follow is Gordon’s role in the tweaked offense under Todd Haley and his rapport with Taylor. The beat reporters will be over this.